An experienced basement remodeler will have years of creatively working with these challenges to help you make the basement look exactly the way you want it to. They'll also be familiar with Minnesota and Wisconsin building codes and standards, and they'll be familiar with the best practices in the industry. The environment of a basement requires different building materials than the rest of the home. Unfortunately, general contractors will often still insist on installing drywall for the walls and ceilings while placing a carpet on the floor- just like they do in the rest of the home. This leads to a problem that DBS has seen by the dozens- moldy drywall, sagging ceilings, musty smells, and ruined remodeling jobs installed by well-intentioned general contractors that just don't see the long-term effects of installing with these options. DBS has been specializing in basement remodeling projects since the early 90's, and we have the experience, lasting products, and reputation you need to feel confident that you've picked the best basement finishers for the job. You can count on solid pricing that won't rise by the end of the job, the best basement finishing plan, and a job done at the scheduled time. 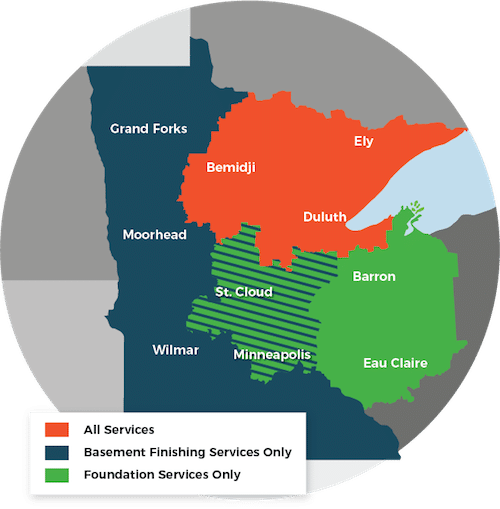 DBS serves Minnesota and Wisconsin in areas surrounding Duluth. For a FREE basement finishing quote, call or e-mail us today!